The festive season might be behind us for another year, but we've still got weeks of summer left. Here's what LiveTribe panellists had to say when we asked what they'd be doing to keep busy over the summer months*. Taking advantage of the warm weather, school holidays and annual leave, more than half (55%) of the people surveyed said they have holiday travel planned over December, January or February. 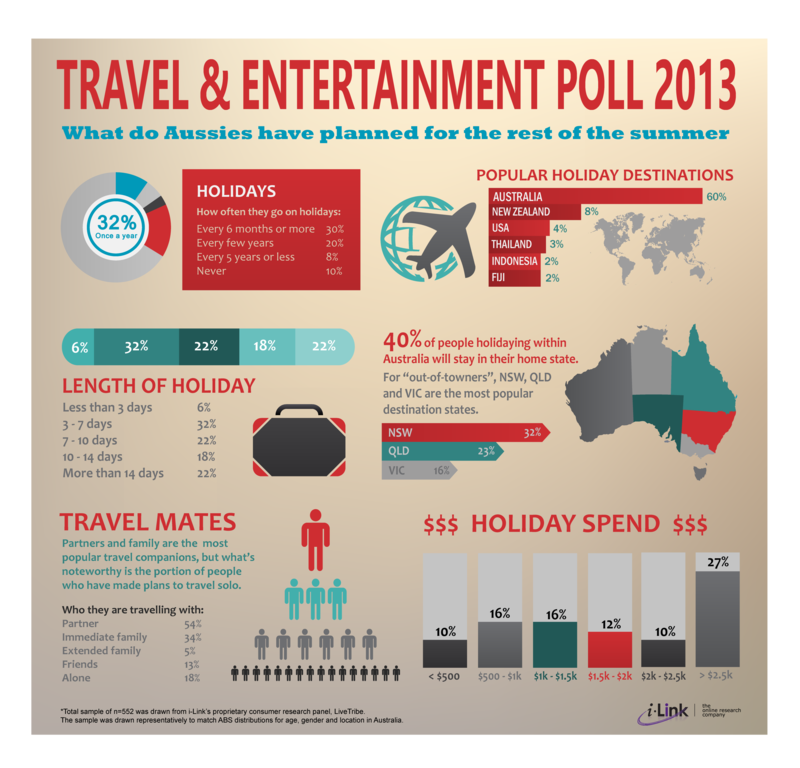 Although overseas travel is more affordable than ever, a considerable portion of respondents plan to keep their holidays local with 60% indicating they would be travelling in Australia. Of those, 40% will take holidays within their home states. Folks from New South Wales seem the most keen to explore their own backyard, with more than half (54%) of people holidaying in NSW being from that state. For those not travelling, summertime entertainment will unsurprisingly include a lot of time spent outdoors. Beaches and parks are popular destinations with 59%, and 67% of respondents expecting to visit those venues more than twice over the next three months, respectively. Dining out was another popular pastime, with more than a third of respondents (38%) anticipating that they would visit a restaurant or cafe five or more times over the next three months. Events are also a draw card, with around a fifth of respondents planning to attend a live music event (22%), exhibition or fair (24%) and sporting event (22%) in the next three months. Live music events appear to hit wallets the hardest, with more than half of respondents indicating that they spend more than $100 to attend such events. In contrast, the majority of those who will attend an exhibition or fair (62%), and about half of those attending a sporting event (59%) expect to spend less than $100. *Total sample of n=552 was drawn from i-Link’s proprietary consumer research panel, LiveTribe. The sample was drawn representatively to match ABS distributions for age, gender and location in Australia.